If you're going into business, I would not suggest competing against members of the Chinese community. As we saw in my recent posting Ridiculous, produce can be had in Chinatown at an absurd fraction of going retail prices elsewhere. If you are traveling to Boston or any other number of select cities in the Northeast, the price of a bus ticket from Fung Wah or other competitors makes one wonder - how do they do it? and will I get there alive? I was first told about the Chinatown bus phenomenon by a college student, typically a good source of information on the latest in deals and discounts, online and off. Word travels fast in the price savvy and networked student community and it was not long before the larger world of New York City became aware of pricing that was, well, just astonishing. Of course like anything deeply discounted, the phrase Chinatown bus, connotes different things to different people. To the cost conscious on a very tight budget, it is a blessing. To the well heeled it is perhaps a good example of how not to travel and you get what you pay for. Bus travel is the lowest common denominator of the commercial travel options. From the perspective of utility, buses will transport you from here to there at the lowest prices. 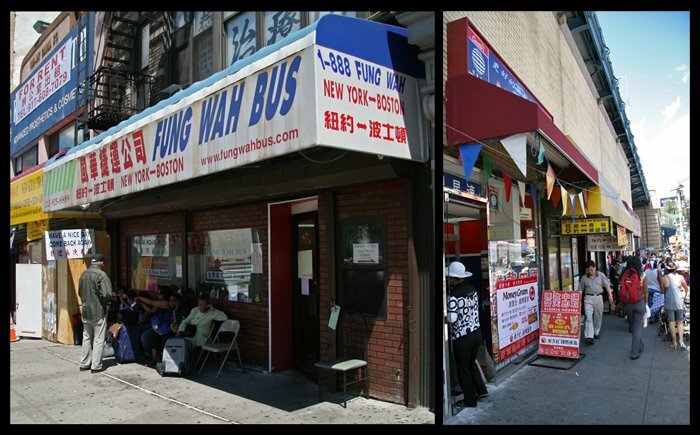 In 1997, Fung Wah, operating as a local dollar van service, took bus pricing to new lows. The pioneering effort was started by Pei Lin Liang. Liang saw the need for competitive pricing to Boston where many students were located. There are now a number of companies in this cut throat business located on Forsyth Street (photo at right). There are various destinations available, typically cities with Chinatowns such as Philadelphia, Washington, DC or Boston. Employees hustle anyone who walks the street there, as if price alone will be an incentive to travel. Admittedly, at times I have been tempted to get on board just to take advantage of the extraordinary deals. A one way ticket to Boston costs a mere $15, with buses leaving hourly.